It is with great sorrow we announce the passing of Sarah Glatt on Monday, February 4, 2019. Loving mother and mother-in-law of Rhona and Brian Birenbaum, Gail Glatt and Bill Ford, Michele Glatt, Andrea Alimi and Maurizio Rossetto, and Lawrence Glatt. Sister of Rose Spigelman and Reuben Lucatch. 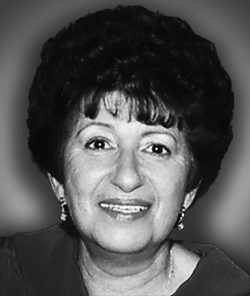 Cherished grandmother of Aaron and Yaffa, Noah, Jonah, Lena, Daniel and Adira, Roni and Alex, Emma and Andrew. Great grandmother of Miriam, Shayna, Moshe Zev, Batsheva and Emmett. Memorial donations may be made online at http://www.kievershul.com. After entering a donation amount, click on “Add special instructions to the seller” and type in Sarah Glatt. Alternatively, a cheque may be sent to: Congregation Rodfei Sholom Anshei Kiev, 25 Bellevue Avenue, Toronto M5T 2N5, indicating in memory of Sarah Glatt. The burial will take place at Mount Sinai Memorial Park, 986 Wilson Ave., Toronto. The shiva will be held at 72 Joshua Ct., Thornhill, L4J 8B6. Shiva Details: Shiva visits Tuesday following the interment up to 9:00 p.m., Wednesday and Thursday 2:00 p.m. to 5:30 p.m. and 7:00 p.m. to 9:00 p.m. Time of Services: Evening: Services Tuesday, Wednesday and Thursday at 7:15 p.m.
My heartfelt condolences. Your mother lived independently until almost the very end. I am very sorry for your loss. Holding all of you in my heart. Ed and I are so very sorry for your loss and wish you peace and comfort. Dear Michele - Thinking of you and your dear family at this difficult time. Gai, Bill, Lena and the entire Glatt Family: We are so sorry for your loss and thinking of all of you. Peace, love and hugs. Anita, Ben & Elsa. Andrea, Emma, Maurizio and the entire Glatt clan — my condolences for the loss and the hard time. She was lucky to have you all looking after her and fighting for her. My deepest condolences on the passing of Sarah. We spent so many years together at opera appreciation classes and tours and shared many happy memories together.We shall miss her scintillating personality. May her memory be blessed. Dear Gail My heart goes out to you and your family on the passing for your mother. My sincere condolences. Dear Andrea and family, i am so sorry to hear about the loss of your mother. You are in my thoughts and prayers during this very difficult time. Thinking of you and sending you a very big hug. Our memories of your family began with you in New York, Rhona - and continued for many years. Here in Toronto - at your cottage - Many birthday parties - many good times. Our sympathy and thoughts are with you all. Dear Gail and family..Our most sincere condolences on your mons passing. Allan and Angie . I did something different for your mom. You will get a notice. Dear Rhona Thinking of you and your family at this time and am really sorry for your loss. May your memories comfort you. Michelle our deepest condolences to you and your family on the loss of your Mom. Sending healing prayers and comforting hugs. I am so sorry for your loss. Harry used to talk fondly of his visits to the cottage in Orillia and what a wonderful hostess his cousin Sarah was . she left you many memories to comfort you at this time. I remember your mother as a very dedicated member of National Council of Jewish Women and contributed many hours of service to the organization and the community. My sincere condolences to the family for your loss. Gail, Bill and Lena and the rest of the Glatt family, my condolences on the passing of your mom. I always enjoyed meeting Sarah. Thinking of all of you. Dear Rhona and family, My sincere condolences on the passing of your beloved mother. May your memories help console you through this most difficult time. Rhona A.
Dear Gail, Bill, Lena, and the rest of the Glatt family: Our deepest condolences on your loss. Thinking of you and holding you in our hearts. Jeff and Gary.